Supply security is high priority at Aranna Packs Ltd.
Our two purpose-built premises provide us with the space to ensure that we can hold adequate stocks at all times for our customers, giving you the peace of mind that your orders will be fulfilled in a timely fashion. Key to providing Irish customers with the best value in UN Aranna Packs Ltd Packs Ltd containers is the research that goes into finding the right suppliers. From the USA to Poland; from the UK to Turkey! 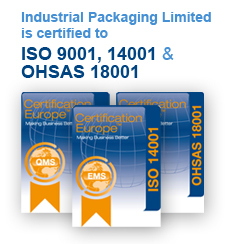 'Aranna Packs Ltd Packs Ltd' has been certified by Certification Europe to the international standard ISO 9001:2008 Quality Management System certification, ISO 14001 Environmental Management System certification & OHSAS 18001 Occupational Health and Safety Management certification. With export economies stabilising at lower levels, costs are again a major focus. We have a prototype development that will automatically remove the lid and band of our 470 diameter drum and then re-close after filling.